Imagine a moment that you want to pump water from atmospheric pressure to a boiler which has pressure level 10 to 15 times above the atmospheric pressure. Before the inventor of steam injector the cold water pumped to boiler by steam reciprocating pump, pumping water to the boiler. The first problem with this design is that, steam used to operate the pump discharged to the atmosphere which reduces overall efficiency of the locomotive. The second problem is that we are pumping cold water into the boiler which reduces boiler temperature. The third but not the last problem is that you have to maintain a pump which has many mowing parts. The steam injectors solve all these problems in one simple an ingenious design. The sketch you see here is not a proportional technical drawing, it is just an animation, which puts emphasize on the injector and makes the rest of the parts such as boiler disproportionally small. Here how a stem injector works. 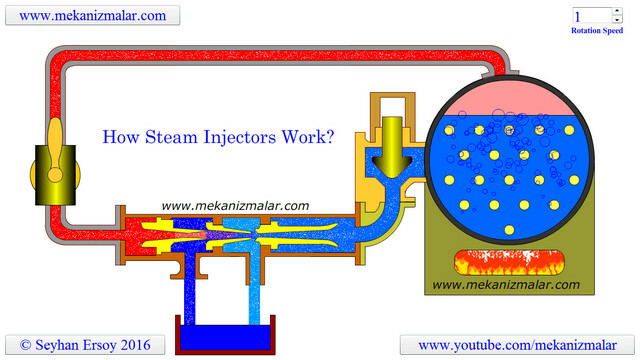 The steam is taken from the boiler is send to the injector with high pressure and with low velocity to the injector. This flow indicated by red background with white dots showing the direction of the flow. The flow is the directed to the converging, diverging steam cone. In this cones converging section, the steam velocity is increased to speed of the sound. At the diverging section, the pressure further reduced and converted to the kinetic energy where steam is moving faster than the speed of the sound. By the time steam lives the cone, speed of the steam is much faster than the speed of sound, but its pressure is below the atmospheric pressure. This flow is shown with light red background. The low pressure created at the exit of the steam cone causes the water in the reservoir to be sucked in to this vacuum shown as blue backgrounded water flow. The water leaving steam cone with high velocity enters to the combining cone. It is called combining cone, because the steam is also sucking large amount of water from reservoir. During this combining process, steam begin to condense and the water begin to get warmer. This mixing and condensing flow proses is show with purple background. During combining process, speed of water was increasing due to hammer effect of the steam jet, but steam was disappearing from the flow as water. Further narrowing the combining cone increases the speed of water further. This flow is show as light blue background. The water jet living the combining cone is pushed into the delivery cone. It is called the delivery cone, because it leads the flow toward to the boiler. Before water reaching to the boiler, the flow velocity is reduced due to diverging shape of the delivery cone. Reduced speed increases the flow pressure above the boiler pressure and this allow the feed water to be delivered to the boiler. This flow is shown as sky blue background. What lays in between combining cone and the delivery cone is overflow chamber. Adding this chamber into the steam injector was ingenuity of steam injector inventor Henri Giffard. This chamber and overflow pipe allowed the excess water to be send back to reservoir and preventing to steam injector to choke, especially when it is starting to operate the first time. It allowed the injector to operate smoothly. Steam injectors operation will be interrupted by turning the valve shown here manually or automatically off. This will cut the steam flow to the injector, in turn, water flow from reservoir to stop. During this time, the check valve shown in here will prevent the boiler water to escape to the reservoir.